A number of medical devices measure or control temperature in the 32-43°C range associated with the human body. Examples include thermometers, patient monitors, infant incubators, radiant warmers and warming blankets. Many devices also have unintentional (stray) heating of parts that can contact the patient for long periods, where limits as low as 40-45°C may apply. Examples include diagnostic ultrasounds and endoscopes, pulse oximeters, as well surface temperatures of mattresses and walls in heating devices such infant incubators and warmers. Most test laboratories working with electrical safety use thermocouples. As recorders and indicators display a 0.1°C resolution, it is easy to assume they are suitable for these measurements. 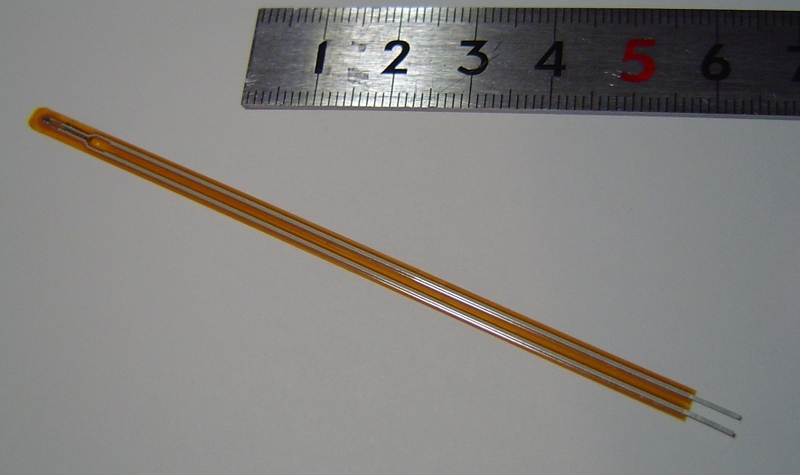 Unfortunately, a thermocouple’s accuracy is usually limited to ±1°C. The main weak point is that they only sense the difference in temperature between two points, and require compensation (internal to the meter or recorder) to convert this to an absolute temperature. Experience from the use of thermocouples on diagnostic ultrasound probes found 0.2~0.3°C fluctuation in test results that followed the room air conditioning cycle that did not make sense since the test sample was isolated from the room. An investigation found that the meter's internal compensation needed around 30 minutes to stabilize, so that if the air around the meter fluctuated in a shorter cycle than this (as was found) the displayed result also fluctuated. When combined with other factors such as noise and basic calibration of the thermocouple itself leads to an overall uncertainty of±1°C. An uncertainty of ±1°C might be OK if the margin to the allowable limit is sufficient, but in most cases it is too high, because manufacturers need to stay close to the limits for functional reasons. Margins to the limit can often be less than 1°C. Good laboratory practice would dictate using measurement system with ±0.2°C uncertainty. For sensor accuracy tests (e.g. on a patient monitor), reference equipment must be around ±0.05°C. 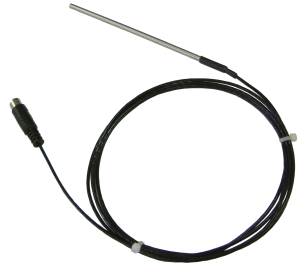 The industry standard for high accuracy is the Pt100 probe: platinum based sensors, adjusted to provide exactly 100.00Ω at 0°C. When combined with precision 4-wire measurement they can achieve resolutions of 0.001°C and accuracy of 0.01°C ~ 0.15°C depending on the grade. But Pt100 probes are bulky: there are really intended for accurate measurement in fluids, such as calibration baths. They can be used performance tests of patient sensors, which can also be put in the water bath, but for measurement of temperature on surfaces of the device, or for performance tests involving spatial and temporal variations, they are not suitable. So what can be used for other body temperature related measurements? The solution comes from copying medical device manufacturers. They use NTC thermistors, which can be very small and combined with relatively simple electronic circuits can provide extremely high accuracy over a limited range, perfect for this application. 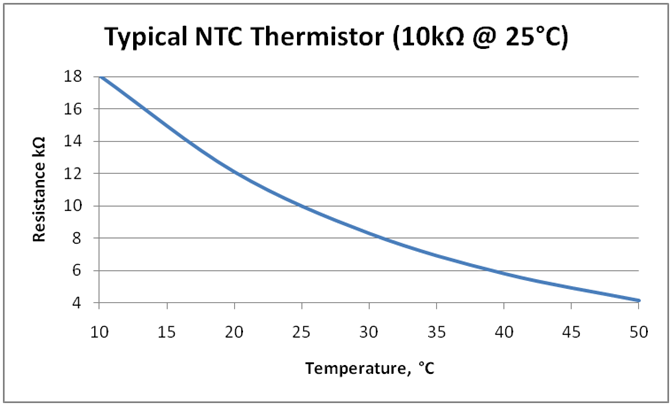 NTC thermistors are widely available and are typically quoted based on their 25°C resistance. They have a roughly exponential curve with the resistance falling as the temperature increases. The high sensitivity (high rate of change with temperature) allows a resolution down to 0.01°C to be easily achieved, but only for a limited range. The picture and graph shown are for Type 103JT-100 available from RS components in Japan at very low cost. Off the shelf the thermistors are specified to be within 1% of nominal values, equivalent to around ±0.4°C, and experience indicates they are typically within ±0.2°C. For higher absolute accuracy they can be individually adjusted to within ±0.05°C against a PT-100 probe (water bath), allowing an overall laboratory uncertainty of 0.2°C to be claimed (assuming the PT-100 probe is ±0.03°C). The hard part for a test lab to handle NTC probes would be converting resistance to temperature, as the relationship does not fit any normal curves. Besides this, real time temperature measurements would require a system that can measure resistance and convert to temperature on the spot. One possibility may be to use common laboratory equipment for measuring resistance, and then interface that equipment with a PC. A range of packages in the PC would allow conversion between resistance and temperature using a function based on curve fitting around the points of interest. 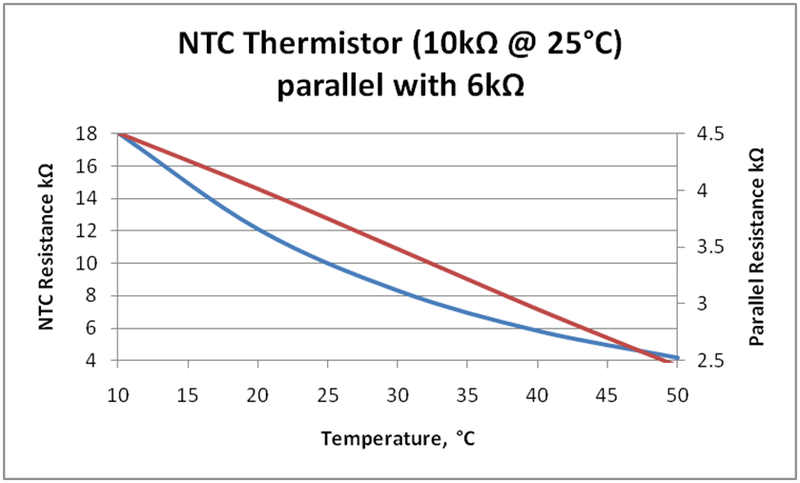 A common method used with NTC thermistor is to use a parallel resistor. This makes the curve almost linear for small regions, as can be seen in the graph left. Depending on the range and accuracy required, with this method may be possible to have a straight line approximation between resistance, although with PC more precise methods are relatively easy. Curve fitting can be done using MS excel’s trend function, plotting the temperature against resistance, and then displaying the equation on the chart. A parallel resistor with 3rd order polynomial "trend" function has been found to accurate to around 0.01°C in simulations over a range of 10°C to 50°C, and within 0.05°C when implemented in an overall system for measuring resistance with direct conversion to temperature between 30°C and 40°C. MEDTEQ has developed an 8 channel system with individual thermistors calibrated to read within 0.03°C of a Pt100 probe, itself calibrated 0.03°C. Dedicated software allows the user to view the plot of temperatures as well as capture maximum, minimum and average temperatures. Contact peter.selvey@medteq.jp for details or more assistance with setting up for accurate measurement in human body temperature.